There are two models of doctoral studies at UoC's Faculty of Arts and Humanities: an individual doctoral project pursued in the standard model "Regular Track" and participation in the structured doctoral model "Integrated Track", in which students can receive different kinds of funding. 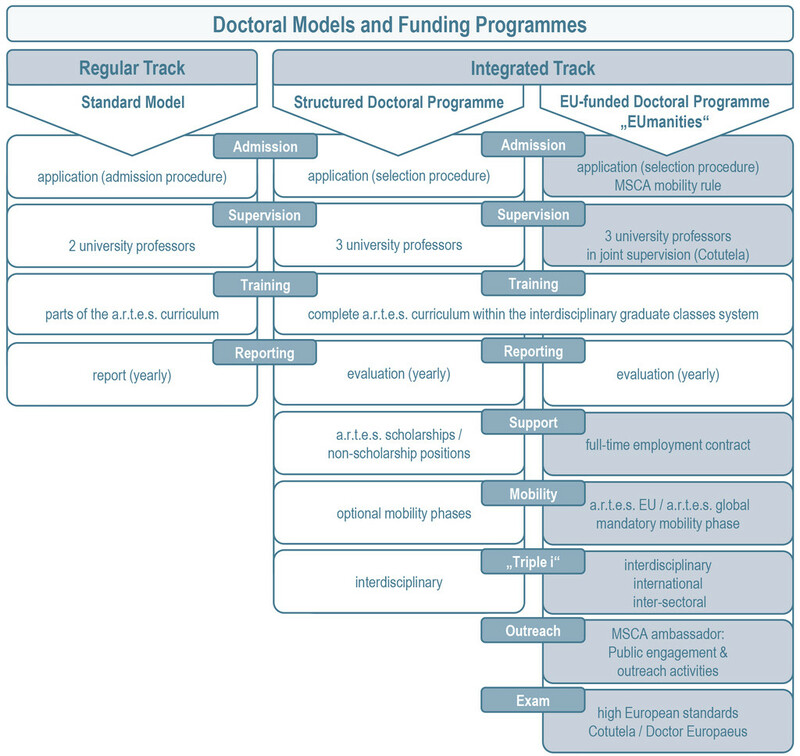 In the application for admission to doctoral studies, the applicant must indicate which model of doctoral studies he or she is applying to. The submission of an application is possible at any time. The admission to doctoral studies is granted by the doctoral board ("Promotionsausschuss") of the Faculty of Arts and Humanities, which meets twice per semester. For more information on how and when to apply for admission to doctoral studies, please contact the Central Doctoral Office. All admitted doctoral students are advised on the academic research their project involves by a primary supervisor. Informationen on the conditions for supervision within the two doctoral models and on the bilateral supervision agreement supporting the relationship can be found here. You can begin your doctoral studies within the Regular Track anytime. The different funding programmes of the Integrated Track are made public at the beginning of every winter semester (a.r.t.e.s. EUmanities and a.r.t.e.s. doctoral scholarships) or every summer semester (scholarships for the preparation of a doctoral dissertation project and Fast Track doctoral scholarships). Funding starts in the subsequent semester, respectively.